The visitor will read the additional fitness advisor credential information and if he/she wishes to enroll in the program, the "Get Certified' link at the bottom will direct the customer to the fitness advisor credential program order form. The creation of the tag lines and ad phrases are the extent of the reseller's marketing influence. 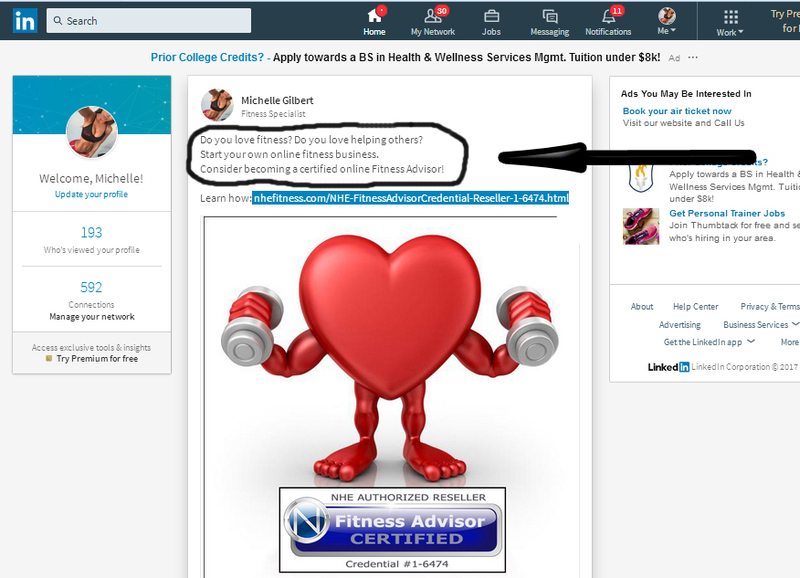 To learn more about the fitness advisor credential, the viewer is directed to click a link. The link is an NHE link and will direct the viewer to an information and order form page that is maintained on the NHE server. All NHE information and order form pages that are connected to the reseller are coded with the reseller's ID number [1-6474]. This ensures that all orders are properly forwarded to the reseller for processing. Every order is submitted directly to the reseller via email. Upon receipt, the reseller must process the order and confirm with NHE that the program is paid for. Once confirmed, the customer is sent all the the credential particulars (e.g. online study guide, online exam administration date options, instructions and administration protocols) within two (2) business days. This will conclude the sale. The next step is for the customer to review the online study materials, schedule an online exam date, sit for the exam (at home or any convenient location with Internet connection) and await exam processing (7-10 business days). NHE maintains the largest fitness service provider network in the world. With access to over 250,000 wellness professionals, we can provide a variety of fitness and nutrition services to any company, in any country in the world. Online fitness services go by many different names (e.g. online coaching, online personal training). It is, however, prohibited for anyone certified by NHE to use the NHE name in their promotional materials. The NHE brand name is reserved only for those employed by NHE (e.g. PFMS, ECIs, PWCs) and those services sold by the NHE organization. NHE closely monitors online misusage of the NHE brand to ensure those certified by NHE are not using the NHE brand in a way that could imply NHE’s consent of those particular services. There are many ways to promote your reseller business. Social media is the most popular platform among NHE resellers. Many fitness professionals maintain an active, subscriber based social media account. Establishing a subscriber based social media account is simple and free to do if a reseller does not presently operate one. Depending on the social media platform, there will be several free or inexpensive advertising and promotional options from which to choose. Many promotional opportunities offered by social media providers cost a monthly fee, while other options are free of charge. The most popular sales technique is the usage of a Facebook or LinkedIn page. The reseller places a simple ad on her timeline (this can be done as often as one desires at no charge). The tag lines and ad phrases are created by the reseller. Here, the ad reads "Do you love fitness? Do you love helping others? Start your own online fitness business. Consider becoming a certified online fitness advisor."